“St. Peter’s Square. March 13, 2013. Afternoon. I commented how this astonishing image demonstrated that the RAIN magnified the sense of commitment and connection. The feed @antclick on Instagram, is an extraordinary one in many ways. I could describe it, in brief, as Raw Poetry in Motion, Captured. 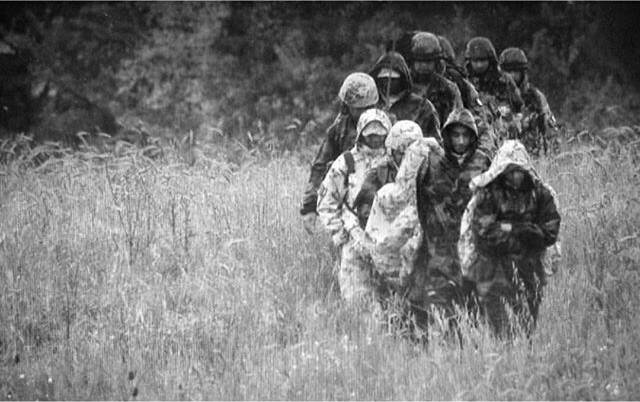 Raw, due to the hard-hitting front line experiences @antclick shares. Poetry, in the emotions he conveys and captions written from the heart. The Motion, is a feeling you get in many of the images, whether taken on the move, phone in hand, whilst film camera in the other. Finally Captured. The situations photographed in the RAIN by @antclick and risks attached to capturing these images may be seen as ‘part of the job’, however, they go well beyond the discomforts or challenges of RAIN most of us would ordinarily experience; both from the Cameraman’s viewpoint and often dramatic events covered, where RAIN has been an additional, yet potent, layer to the story. It is always a mark of someone ‘at one’ with their vocation when they see the ‘beauty’, despite the challenges, in what they do. The results are in their work. Here is a testimony to that. The images of @antclick share history and events, coloured with Rain. They lend a fascinating perspective to RAIN and our experience of it. With Many Thanks and Kind Permission, I am here able to write a transcript of the interview with Antonio, @antclick Instagram. A: There is something primitive, archaic, about the election of a Pope. In this hyper technological world, to see all these people in a square, looking up to a large building to see the news announced by smoke coming out from a chimney looks like something from a far away past. And yet the eyes of most of the world were on that square that day. When the man dressed in white came out on the balcony almost nobody knew who he was. It’s hard to believe now, seen the outstanding personality of Francis. And that added to the feeling it had been a very special day. M: I also like how you have used “mercilessly” to describe the unrelenting RAIN on that day…. A: Rain fell constantly from the morning, until just when the Pope came out. In the evening. This is very unusual for Rome. I had conquered my spot in the early morning and could not move. Like me, most of the pilgrims around me. So we all accepted we would just stay there, without shelter. The incessant rain added to the feel of a primitive, powerful ritual. And, odd seeing that the square was filled with hundred of thousands, I think the rain made everyone more quiet, immersed in himself. 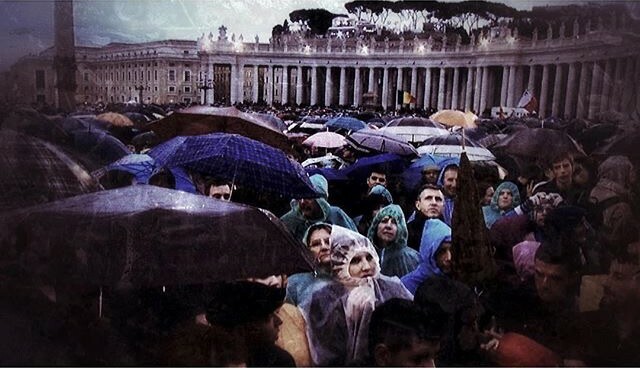 Until the Pope came out, except the odd chanting or praying, the square was filled with silence and the falling rain was all you could hear. M: Beautifully expressed! So, what are the first words that come into your mind when you think of RAIN? A: The first word that comes to mind is life. The second tears. But good tears, the tears of, when life runs strong. M: Which of your RAIN images stands out most for you? A: I think it is the one of the rescued migrant looking out of a bus window during a rain storm just after disembarking in Sicily after his odyssey. I wondered how sad and scary this foreign land must have looked to him from that window. M: What is your most memorable or earliest experience of RAIN? A: I think the reason why that picture hits me is because of one of my earliest memories of rain. I come from Sicily, a land blessed with beautiful weather. My childhood memories are filled more with sun and blue sea than with rain. Autumn, however, could bring violent rainstorms and and that was the case in September 1977, one of my first ever days of school. I remember my mother driving me on a small MiniMinor. The noise of the wipe screens, the cars with their lights on in daylight, water running down the car windows, cars stuck because their engine got wet along the way… And the sad, wet corridors of the school – a foreign land for me then – as I walked to class and saw my mother’s Mini disappear in the rain. M: It is fascinating how events can trigger our response and inspire new directions: in the way your @antclick feed was triggered from the moments you saw your son starting to walk. Can you tell me more about your memory of events you had experienced returning as ‘stills’ rather than the film you are accustomed to as a camerman? M: How do you see the difference with RAIN in stills and film, both in process and experience? A: I find stills more powerful and more difficult than film in respect to rain. I find in both cases ‘shot rain’ risks looking weaker than real rain. In film you can still hear it and see the drops falling. 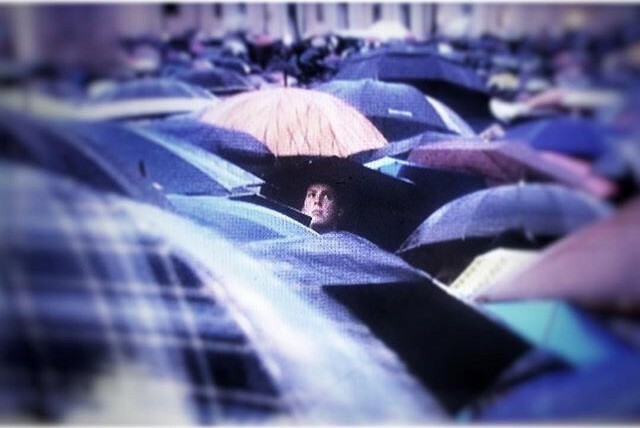 In stills you have to tell it through its effects: the face of someone looking up or holding an umbrella… In both cases, to get pictures you have to get wet. Which is what I like about this job. M: It almost feels that, with respect to the dramatic events you have documented, to talk about RAIN could be seen as insignificant….. and yet, when it is a backdrop to events somehow the emotions and events seem more determined and can be brought home to us, as we all share the experience of RAIN. It’s a common thread…. what do you think? A: I think you are absolutely right. Rain gives a different taste to an event, a different color. It can often intensify it. M: Then there are cases where RAIN IS the news : storms, flooding, destruction… do you have a particular memory which made a significant impression on you? M: So, in an ‘aggressive’ situation, do you think RAIN has a role in terms of people’s reactions, interactions? A: That’s an interesting question. I don’t know. I think the assumption is that rain calms people down. It wakes them up from anger. Discomfort can make people more human. A: Rain is an enemy of my job and of the gear I work with, in a way. So, one needs to take care of that. I do the obvious: rain-covers, dry change at hand when I can – always a second pair of shoes. Wet feet are the absolute worse for me. I use shower-caps for my lens. They are good and allow me to keep looking through the lens, while waiting for an event, without wetting it. It’s not only a question of protecting against rain, also to put yourself in the best position to work in rain, which can produce great pictures. Like with other things, I think in my job, it is important to manage to gain access as far and as deep as you can. Like with danger, the more you do it cautiously and knowingly the better. Slowly, slowly, I think you can go almost everywhere and film under almost any conditions. Slowly, cautiously, thinking in advance of the problems you could have. A bit like in sailing. M: When do you enjoy and not like RAIN? M: …and your favourite way to experience RAIN? M : Could you talk about your selected pieces of RAIN music and film please? A: I am afraid I do not have great suggestions regarding books or music. I like very much rain scenes in some films like Apocalypse Now, the Mission, In the Mood for Love, Blade Runner. Rain in cinema can be epic. A: There is a nice song by Italian singer Vasco Rossi, called ‘Sally’, where he tells the protagonist – a young, troubled woman – at the end of the song to listen to the RAIN falling outside, ‘how beautiful’, I think he says… That RAIN, reminds us of life in us and around us… that we are part of the natural world. M: There seems to be a very tangible and responsive way to how you interact with RAIN. You deal with the moment. Responding thoughtfully and beautifully recording events of our shared history … and in our shared RAIN. Thank you so much for sharing your RAIN here too! Please check out the powerful, fascinating yet touching Instagram page of @antclick with notable historic events and personal stories told through the eyes of a very perceptive news cameraman and “aspiring seaman”. Since this interview, there has been a new development in @antclick Surviving frames, a “The Surviving Frame – Archetype” . As @antclick explains “… It has often been easier for me to see the powerful things that move underneath human events in the lives of others than in my own…..I will post images, looking more at the universal ‘lesson’ I see in them than at the specific story.” … For my part, I can hope that on occasion, these will include RAIN too!